Why Do We Need a Kashrut Policy? Why is Kashrut so essential? Why observe these laws at all? There are many fine books on this topic. Since this is a policy statement, not a textbook, we will state the rationale for Kashrut in a few general rubrics. Kashrut is first and foremost a mitzvah, a way of showing our love and reverence for God. Kashrut is a discipline of holiness. Wherever the dietary laws appear in the Torah, it is in the context of k’dushah. Kashrut, along with the blessings and rituals of meals, raises the act of eating from merely satisfying an appetite to a consecrated act. Kashrut is a statement of Jewish identity. It links us to the worldwide community of observant Jews, and to past generations of Jews. It reminds us, every time we eat, of our Jewish commitments. Kashrut, through its rules of humane slaughter, and through limiting the kinds of creatures we can eat, is a way of enacting reverence for life and understanding that consumption of the flesh of living creatures is a Divine compromise with human nature. As a congregation, we have one more reason for assuring the kashrut of foods we serve. We are a k’hillah k’doshah, a sacred community, and as such we must be welcoming and inclusive of members and guests who observe the dietary laws. Any group using our facilities must adhere to our standards of kashrut. Various people may have different interpretations of specific aspects of kashrut, but the synagogue must have one clear consistent policy. We trust that all of our members and friends, whatever their personal practice may be, are willing observe these policies, no matter what their personal level of observance may be, so that any member of the Jewish community can feel comfortable eating in our building. In addition, any Beth David event, wherever it takes place, must be kosher. This includes all affiliated groups, such as Sisterhood, Men’s Club, and Youth Groups. Food which does not meet Beth David’s kashrut standards may not be brought into the building. The keys to the kitchen cabinets will be kept by the Ritual Director. No one may prepare food in the kitchen without direct supervision of the Ritual Director, one of our certified para-Mashgiḥim (kashrut supervisors), or an approved outside mashgiaḥ. All caterers and meal preparers must have their foods and cooking ingredients checked by the ritual director or their designee to ensure their permissibility. All food preparation must be done on site or in a certified kosher kitchen as approved by the senior rabbi. No cooked foods may be brought in from outside unless it is prepared in an approved certified kosher kitchen. (There is an exception for baked goods, as well as for potlucks held outside the kitchen and social hall. See below). Baked goods may only be supplied by a bakery approved by Beth David, hekhshered commercial products, or home-baked according to the guidelines below. Food brought in for personal use by an individual must be dairy or pareve and may not be brought into the CBD kitchen or social hall, nor may any utensil from the kitchen be used with it. Congregation Beth David has a tradition of friends helping Bar and Bat Mitzvah families by baking for their simhah. This has been allowed because of the limited number of supervised bakeries in our vicinity. This means that great care must be taken in order not to compromise the kashrut of the kitchen. We urge you to follow these guidelines scrupulously. We trust that our members care about Beth David’s reputation for proper kashrut and will indeed observe these rules faithfully. No foods other than baked goods may be prepared or cooked at home. They must be baked in a kosher home, or if in a non-kosher home, the baker must use disposable aluminum pans. The baked goods must be brought in still in that pan, and cut in our auxiliary kitchen space (separate from the main kitchen). All mixes or ingredients must carry a hashgahah (kosher certification). This will be explained below. Baked goods must be brought in on paper plates and served only on the special separate cake trays used only for that purpose. The Oneg Shabbat/Kiddush preparation must be done only on surfaces designated for that purpose. CBD kitchen utensils may not be used with Oneg Shabbat/Kiddush foods. We prefer that home baked goods not be served with catered meals, and some caterers’ independent hashgahah may prohibit it. Check with your caterer. All baked goods served on Friday night must be pareve, which means no dairy products are used. The following ingredients are kosher without certification. Fresh fruits (checked for bugs), fresh vegetables (checked for bugs), eggs (checked for blood spots), milk, salt, sugar, flour, pure spices, unflavored tea, unflavored coffee, beer, raw grains beans and rice, raw nuts or nut flour, and pure olive oil. All meat products must come from a kosher butcher under rabbinic supervision, as approved by the senior rabbi. Fresh fish (kosher species having fins and scales, excluding swordfish and sturgeon) does not require rabbinic supervision, but must be rinsed thoroughly before being cooked. Because processed foods must both contain kosher ingredients and be prepared in a kosher way, all prepared or packaged food (including canned, frozen, baked, or foods otherwise changed from their natural state) as well as dairy products (cheeses, yogurts, etc.) must bear kashrut certification from a recognized authority If there is doubt as to a particular symbol or kashrut authority, the senior rabbi will give final approval. Only wines, grape juices, and grape products with a kashrut certification may be used for Kiddush (the blessing over wine), though fresh grapes do not require certification. Beth David does not require that kosher wine be served with meals (though some caterers do), but we urge you to consider the many excellent Kosher wines now available. If you choose to serve unhekshered wines they must be domestic, and may not be brought into the kitchen or used for cooking. In any event, we ask that some kosher wines be provided for those who want them. Pareve means foods that are neither meat nor dairy. Because of the complexities of food additives, this has become a difficult subject. Obviously, any foods served with a meat meal (or at a Friday night Oneg, since many people have meat meals), must be pareve. All mixes, ingredients, or store-bought baked goods must have a hekhsher and be labeled pareve. “P” does not mean pareve; it means kosher for Passover. 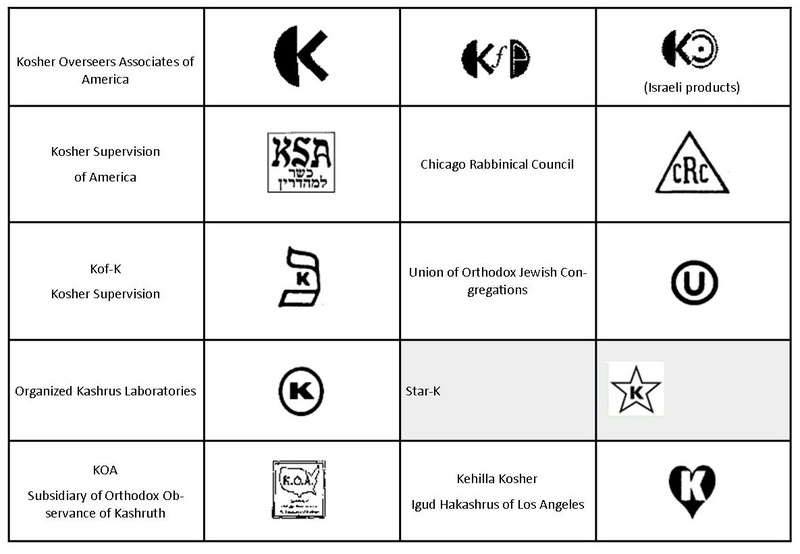 Beth David accepts all products with a heksher except for Tablet K. In addition, the letter “K” by itself can’t be copyrighted and therefore has no value as a kashrut certification. Since eating meat is a compromise, vegetarianism has an honored place in Jewish observance. We urge our members to always include a vegetarian option in considering menus, especially at a meat meal. When wine is served, it is our policy always to have grape juice available for those who can’t drink alcohol. Although it is impossible to keep track of all possible food allergies, it is an increasingly common courtesy to label foods containing nuts, since some people with that allergy have severe, life-threatening reactions. Cold foods may be cut and prepared on Shabbat. Food may not be cooked from a raw state on Shabbat. All cooking must be done ahead of time, and the foods may be reheated using the following guidelines. The stoves and/or ovens may not be turned on or adjusted by a Jew. The food that is being reheated must be mostly dry not liquid. That means that soups, sauces, or other similar dishes may not be heated on Shabbat. Soup may be served if it is put in a crockpot to cook before Shabbat and is left on overnight. Food preparation for Holidays is the same as for Shabbat with the following exception. On holidays food may be prepared from raw as long as the following policies are observed. The stoves and/or ovens may not be turned by a Jew. The food that is cooked on the Holiday must be for that day only. It is not permissible to cook food on a Holiday for use on another day. If it is necessary to cook on a holiday that directly precedes shabbat, please speak with the senior rabbi regarding an Eruv Tavshilin. This makes it permissible to cooking on the holiday for Shabbat. Beth David, as a Conservative synagogue, supports kashrut as a basic tenet of Judaism. Furthermore, Beth David is a k’hillah k’doshah, a sacred community, and so must have one clear consistent practice. We trust that all of our members and friends, are willing to observe these policies, no matter what their personal level of observance may be, so that any member of the Jewish community can feel comfortable eating in our building. Food brought in for a potluck must be kosher (dairy or vegetarian only). It may not be brought into the Beth David kitchen, nor may any utensil from the kitchen be used with it. Home-prepared food must be made in disposable pans. All mixes or ingredients must carry a hashgahah (kosher certification). This will be explained below. No utensils, other than disposables, may be brought from home. Fresh fruits, vegetables, eggs, salt, sugar, spices, tea, coffee, soft drinks, and milk do not require kashrut certification. Fruits and vegetables should be inspected for bugs and eggs should be checked for blood spots. Fresh fish (kosher species having fins and scales) do not require rabbinic supervision, but must be rinsed thoroughly before being cooked. Because processed foods must both contain kosher ingredients and be prepared in a kosher way, all prepared or packaged food (including canned, frozen, baked, or foods otherwise changed from their natural state) as well as dairy products (yogurts, etc.) 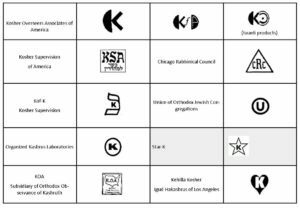 must bear kashrut certification from a recognized authority, such as the O-U or O-K. A list of symbols used by such authorities is attached to this policy. There are hundreds of supervising agencies. If there is doubt as to a particular symbol or kashrut authority, the rabbis will give final approval. The following are symbols commonly found on products in the Bay area.